If you read my post on December 29, you know that day was our 44th wedding anniversary. 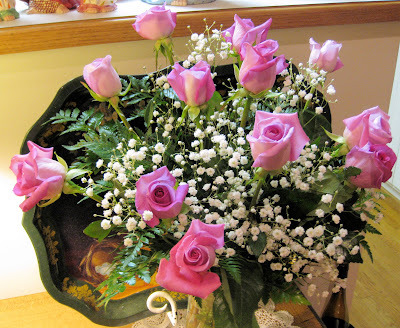 My dear man brought home to me, a bouquet of beautiful pink roses. At this time, they have grown deeper in color and their heads are now drooping from the exhaustion of showing off their beauty. The meaning of pink roses and many different shades of pink roses symbolize an expression of romance, beauty, elegance, joy and admiration. "If I picked a rose for everytime I thought of you, I would be picking roses for a lifetime." 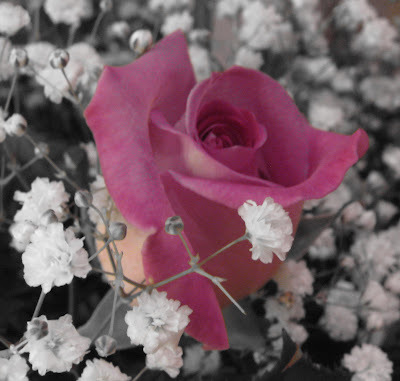 I have my music from my Foto Friday playing and looking at your roses. My favorite for sure. You have captured the true meaning. P.S. Taking my son's x out shopping all day tomorrow so I will talk to you tomorrow night. What a beautiful bouquet! I'm sorry I didn't see your post so if you please, accept my belated "happy anniversary" wishes. I hope it was grand and here's to more years of love, happiness and laughter. Happy Pink Saturday! Happy New Year & belated Happy Anniversary! you got lovely roses here! so pretty! Happy Pink Saturday, and a belated Happy Anniversary. Our anniversary was the 29th as well. We've been married 30 years.. Thanks for sharing your beautiful pink roses.. Happy Anniversary! Beautiful post. Thanks for sharing. Happy Pink Day. Oh Deborah, this is such a beautiful post. Thank you so much. I admire your forty-four years. That is a treasure indeed. God bless you both. We are at thirty-eight years of marital bliss. The roses are gorgeous but the the 44 years are to treasure for ever. You are indeed a lucky girl. So pretty! I had these same pink roses in my wedding boquet 10 short years ago! I can't wait for my 44th! These ar beautiful! Congratulations on 44 years of marriage!! 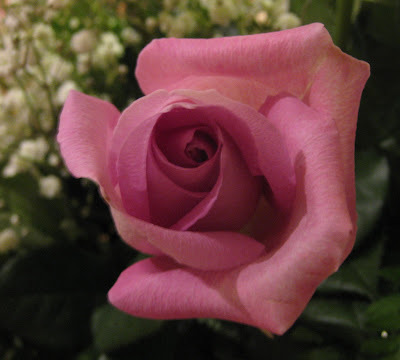 That reminds me of the pink roses my husband and son sent me when we found out we were having our little girl. She is in my pink post today! Happy New Year! What lovely thoughts on pink roses! I Too posted about pink roses today, my first pink saturday! Oooooo, your roses are simply beautiful. Happy Pink Saturday..and have a lovely day. Beautiful, beautiful roses!! Happy Pink Saturday! Such delicate pretties! Happy Pink Saturday! Love, love, love roses! Check out my blog today if you want to get an eye full. Happy Pink Saturday! Your roses are awesome, what a sweet DH you have. Very long-lived roses. How nice. Hope your 2009 has started out happy and as beautiful as these roses. I had to let you know you've been 'tagged'. Pls visit my blog for details. Congrats on your 44th Anniversary! We celebrated #40 last June--I'm still in shock that it has been THAT many years! Happy Pink Sat--your roses are text were absolutely wonderful!!! I was out shopping all day yesterday with Riley's x. She's 16 and I love her to pieces. She appreciates every & I love her company. Now if he could eventually marry someone like that I would be a very happy camper!!! I miss you but I'm thinking of you. I'm going to hook that cute Pink Lady to my site. Thanks for sharing her ..
BTW Are you going ALL PINK on me?? You so deserve the prettiest roses Deborah - Larry did a great job picking out these beauties. Do you, like me, save them when they're dried? I love how they change to muted colors and get that rustling, papery, vintage look! Gorgeous pink roses! Larry did a good job. Your roses are the most amazing shade of pink! 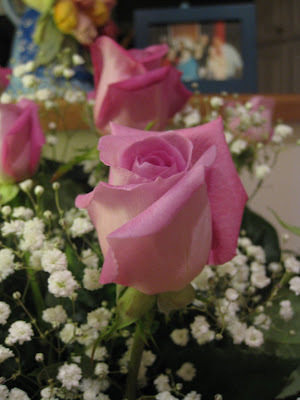 Pink roses are my absolute favorites, and I always get a bouquet of them on our anniversary!! I wish I had found your blog sooner, it is so interesting!! I love your new background! I'll have to checkout that site. "Twins Are A Kiss Blown From The Hand Of God"